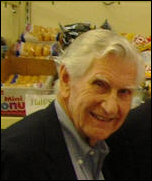 Beginning in 2011 each year an individual will be chosen to receive the Elbert C. Cole Jr. Legacy Award honoring an individual that exemplifies the values and vision personified by Dr. Cole throughout his life. Dr. Cole inspired all to look at aging as a time of opportunity to continue learning and to give back. Dr Cole was particularly well known for his belief that some of life’s best, most important work takes place in the later years. This award is initiated to honor and recognize an individual who personifies this value by demonstrating the importance and present use of their knowledge, talents, skills and passions in their work or volunteer service. The awardee will be chosen from candidates nominated by organizations or individuals throughout the greater Kansas City metro area. The awardee will receive a $5,000 monetary award. Nominations should be based on the following criteria. Must be 65 years of age or older. Should be an undeniable role model – their story should inspire others. Candidates must demonstrate that they are making a big difference, creating a significant impact in the community and serving as a role model for others. 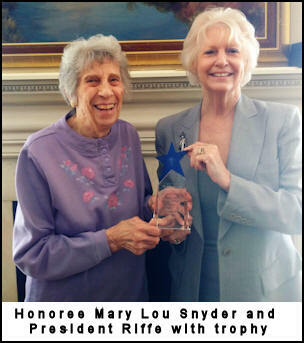 Mary Lou Snyder has given over 1,400 hours of her time as a volunteer at the Shepherd’s Center. This March, she will have been volunteering for 25 years! Mary Lou can be found leading the Line Dancing class each Friday at Adventures in Learning and in her time with the Center has led over 950 line dancing classes. 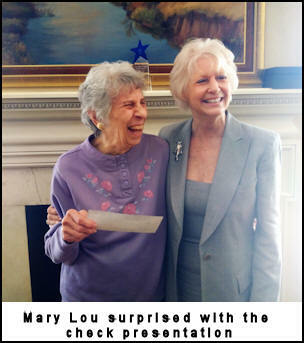 Mary Lou has a joyful personality and inspires her peers and our younger volunteers alike. She goes above and beyond and often is the last volunteer to leave the program, as she stays around to help clean up lunch and make sure the rooms are organized. Mary Lou is a living example of aging with grace, and brings an irreplaceable spirit to the program. There is a core group of “line dancing ladies” who participate weekly in the class. 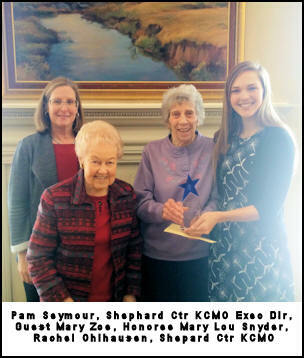 Each semester, Shepherd’s Center is host to over 30 UMKC students who complete volunteer hours in the community as part of their Health Science and Aging course. Line Dancing is a favorite of many students who get to volunteer with Adventures in Learning. It is a pleasure to watch the students begin skeptical that any group of old women would provide them a challenging exercise experience, and we are always heartened and when they leave the class winded and toe-tangled. They’re shocked that they couldn’t keep up like they thought! Mary Lou welcomes new class members with joy, and always shares her smile and energy with them. Just by being herself, Mary Lou challenges anyone who had a stereotype of aging in their mind, both young and old alike.